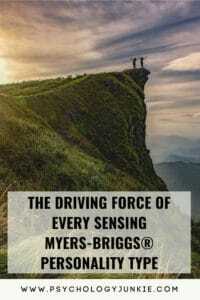 A few days ago we talked about the driving force or ambition of every intuitive Myers-Briggs® personality type. As promised, today we’re going to go over some of the basic ambitions of each sensing personality type. What is a Sensing Personality Type? Sensors are identified by the “S” in their four-letter type code. If you’re an ISFP, ISTP, ESFP, ESTP, ISFJ, ISTJ, ESFJ, or ESTJ then you are a sensor. Sensors are known for being grounded in reality, observant, and attentive to details in the world around them. They trust fact over speculation and are usually highly attuned to either where they are in space (SPs) or what’s going on inside their bodies (SJs). So without further ado, let’s get to the sensing types! ISTJs have an innate need to be sensible and realistic in everything that they do. They monitor the world around them to see what’s trustworthy, dependable, factual and predictable. They have a careful and focused eye for things that get in the way of effectiveness and logic. Whether they are instructors, parents, or teammates, they have a gift for planning, monitoring, and ensuring everything is done with careful precision. They yearn for stability, community, and a sense of comfort and quality in the world around them. They make excellent supervisors, community leaders, teachers, and researchers. ISFJs protect and care for others, keenly observing the needs and struggles that others are dealing with. They crave quiet, peaceful lives full of harmony and security alongside loved ones who are well-tended. They are the ones who take the time to notice the earthy scent of rain, the calm serenity of a candle and a good book, or the gentle humming of crickets on a summer night. Practical and blessed with a surprising sense of humor, ISFJs have a knack for creating comfort and peace in the world around them. They are attuned to security risks as well as the emotional and physical needs of others. They strive to make the world a calmer, safer, and more understanding place. Responsible and hard-working, ESTJs thrive when they can check that final item off of their to-do list. These grounded, logical types yearn for achievement and security in a world that is constantly shifting and transforming. They set goals that will challenge them yet improve the world around them. They believe in responsibility to their communities and diligence in every task they undertake. Having an organized, effective environment and a purpose to strive for keeps them content and satisfied. Their skills make them excellent teachers, managers, lawyers, and community leaders. ESFJs have a natural gift for understanding the needs and emotions of the people around them. They use this gentle understanding to create organized, harmonious atmospheres and events. Their concern for others is genuine and they strive to make people feel comfortable and welcomed. Helping others gives them a sense of purpose and adds true joy to their life. They are good at creating unity, group cohesion, and security in a world that is constantly shifting and changing around them. They make excellent teachers, humanitarians, counselors, and mediators. Cool and independent on the outside while brimming with ideas on the inside, ISTPs are the ultimate artisans. They want to develop mastery in hands-on pursuits and inventions. These types are skilled in the use of tools and the practice of breaking things down and learning how they work. They have a knack for grasping the underlying essence of objects and mastering how each piece fits together in the most efficient way. ISTPs like to have a variety of skills and interests and they tend to know more than people realize because of their reserved, hard-to-read demeanor. Their keen sense of logic and their intense curiosity make them adventurous and intriguing. They make excellent craftspeople, tacticians, developers, and artists. ISFPs seek freedom and beauty in the world around them and in their own spirit. These individuals crave internal harmony and peace with the outer world. Their talents lie in resourcefulness, creativity, and an eye for the opportunities that exist in the present. They tend to have gifts with aesthetics and they enjoy making their surroundings beautiful. They are both idealist and doer, finding hands-on ways to make life better for the cause or people they care about. ISFPs have a gift for reading the current situation and understanding body language, intent, and even inauthentic motives. Their integrity and strong observant nature makes them excellent doctors, counselors, veterinarians, and artists. ESTPs have a skill for mobilizing the people around them and making things happen. Engaging, exciting, and adaptable, they take on risks and challenges with confidence. They crave to push the boundaries of what’s possible – whether it’s scaling a higher peak than anyone else has climbed or succeeding in a business venture that others deemed impossible. Their desire for freedom, excitement, and possibility propels them through a life that is usually anything but ordinary. They make excellent entrepreneurs, performers, stockbrokers, and paramedics. ESFPs believe that every moment in life holds an opportunity. Whether they’re backpacking through the Himalayas or helping out the homeless in their community, ESFPs want to fill every moment with beauty and happiness. They are often masterful at entertaining, motivating, and presenting and they are usually gifted storytellers. They crave a life that makes use of their skills and allows them to facilitate, help, and bring joy to the world around them. They like a life full of variety, where they can adapt to new and surprising situations and experiences. This adaptability and sense of adventure drives them to careers as entertainers, entrepreneurs, mediators, and surgeons. Are You an “N” (Intuitive) Personality Type? Click Here to read the section for YOUR type! Have Any Thoughts to Share? Let us know in the comments! Want to find out what your personality type is? Take a free online assessment here. (This is an affiliate link).